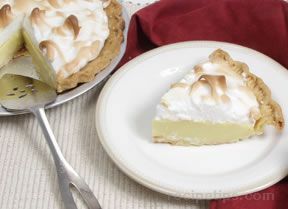 Creamy vanilla filling topped with sweet meringue creates an unbeatable combination in this tasty pie. 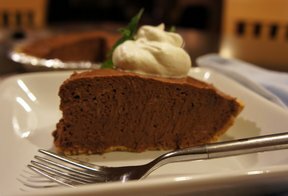 Another cream pie to try is our Homemade Banana Cream Pie, or for a delicious pie that is a little different from a traditional cream pie, try our Boston Cream Pie. See the Single Pie Crust recipe for instructions on preparing the crust for this pie. Bake pie crust for approximately 30 minutes, according to Single Pie Crust directions before adding the filling. In a medium size saucepan, add the milk, sugar, cornstarch, salt, and egg yolks. Stir ingredients until blended, and then over medium heat bring this mixture to a boil and cook until thick. Stir while the mixture is heating to prevent burning on the bottom of the pan. Once the mixture has boiled or thickened, remove it from the heat and stir in the vanilla. When thoroughly mixed, pour the mixture& into the baked pie crust. Set aside while making the meringue. Allow egg whites to become room temperature. Beat egg whites on high until they form a soft peak. While continuing to beat, add in the salt and then add the powdered sugar a couple of tablespoons at a time. Beat until the meringue forms stiff peaks. Add cream of tartar and beat just enough to mix thoroughly. Do not over beat. Spoon the meringue on top of the pie filling and spread evenly over the pie, making sure it is spread so that it is touching the crust around all the edges. Make small peaks in the meringue to give it a finished appearance. Place the pie into an oven preheated to 350°F. Bake until meringue is lightly browned, approximately 15 minutes. Remove from the oven and allow to cool before serving.